Medlock Park is served by public transportation along its Scott Boulevard and North Decatur Road boundaries. 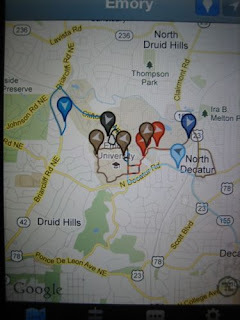 Conveniently, there are apps that allow you to review all available routes and track the buses' location in real time. - the Emory-bound stop is in front of Melton's, before the Sunstede Rd. intersection. Look for the MARTA marker on a post. - the N. Dekalb Mall-bound stop is near the Scott. Blvd. Baptist Church (before reaching Barton Way). Update: The Medline LCI study includes plans to enhance these stops' visibility and accessibility. 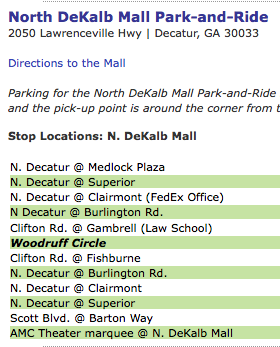 Emory's North Dekalb Mall Cliff Shuttle travels between Clifton Road and the mall via North Decatur Rd. and Scott Blvd. See below for its Medlock area stops. There are many other routes departing from campus and serving nearby locations, see the Cliff Shuttles website for details. UPDATE: there is a restriction for minors using the Cliff shuttle. Parents who wish their Druid Hills High students to use the Cliff shuttle can contact parking@emory.edu to request access to the CCTMA (Clifton Corridor Transportation Management Association, http://www.cctma.org/). 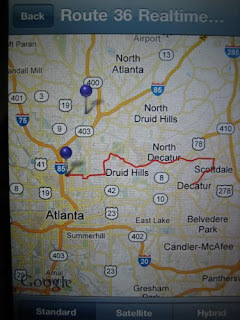 Indicate the student's name and that they attend Druid Hills High. The parent will receive a letter; the student should keep a copy of the letter as the bus drivers are instructed to check. Transloc app: Sample view of a flock of Cliff shuttles at work. Remember: Cliff shuttles are free! MARTA app: bus #36's route (sample of real-time view). MARTA route # 36 (N. Decatur Rd./Virginia Highlands) runs along North Decatur Road while connecting the East College and Midtown Stations. Two additional routes that briefly run along Scott Blvd. are route # 123 (N. Dekalb Mall/Belvedere) and route # 75 (Tucker).